s’ Central Library main building was constructed towards the back of the library. UCL has the largest collection of books, palm-leaf and parabike paper manuscripts in Myanmar. It leads all Universities and Colleges libraries. The collections of UCL are mainly for research and reference. 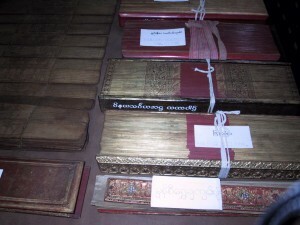 Myanmar Books Section has valuable and unique resources of Myanmar traditional and national heritage collections of palm-leaf and parabikepaper manuscripts as well as rare printed books. 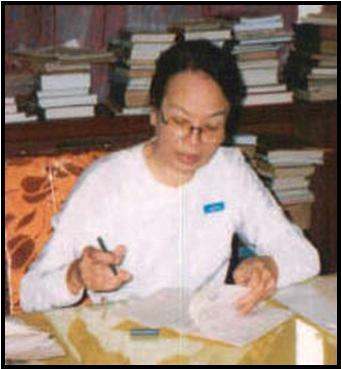 They are on Buddhism, history, literature, astronomy, astrology, indigenous medicine, jurisprudence, customary law, language, Myanmar dictionaries, poetry, novels, plays, etc. Some other literature and languages of ethnic groups of the country, like Mon, Shan, Kachin, Kayin etc. 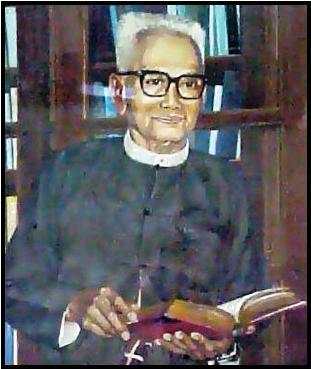 and retrospective publications of Myanmar books as early as 1872 has also been collected. The English Books Section has collected some early 19th Century publication, many rare books on Myanmar, books on ASEAN countries and neighbouring countries like India, Bangladesh and China. It collects all books published in English and other languages on Myanmar. There are some books in French, German, Japanese, Chinese and Indic languages, especially in Pali. Collection in this section consists of rare books on Myanmar like Census of Myanmar, Gazetteers and English books on various general subjects. 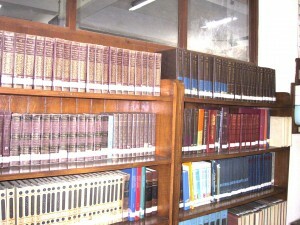 UCL has collected about 1,500 titles of both English and Myanmar periodicals. This section is strictly a reference section. There are many bound volumes of newspapers, magazines and journals published in Myanmar, some dating back to the 19th Century. It has the best collection of old, rare periodicals published in the country. The library is oriented to research and teaching to meet the needs of university teachers, under-graduates and post-graduates. Consequently not only all faculty members and students from the 48 Universities, Colleges and Institutes of Higher Learning, Government departments, but also research scholars, writers and public service personnels make use of the library. The General Reading Room has a seating capacity for over a hundred readers. 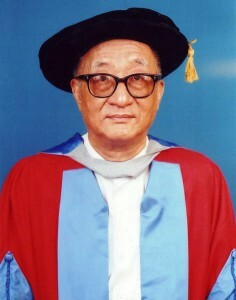 The General Reference Room provides thirty seats for researchers. There are also five carrels for individual scholars. 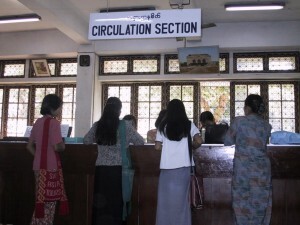 Circulation hours are 9:30 am to 4:00 pm (Mondays to Fridays). This section has a rich collection of about 15,000 Myanmar manus cripts on palm-leaf and about 4,000 parabikes (written on Maing Kaing Shan handmade paper). Collection of palm-leaf manuscripts and parabikes focuses on non-religious subjects like literature, history, astrology, traditional medicine, customary law, Buddhism and sociology and economic conditions of the past. The Reprographic Section was set up in 1973. 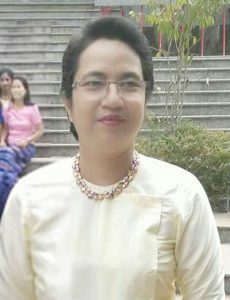 Microfilms of colonial documents on Myanmar history were received from the India Office Library and Record in London, and microfilms of rare Myanmar novels and Pyazats (drama) were received from the British Library. Preservation by microfilming Ancient Myanmar Manuscripts Project was carried out in cooperation with Cornell University Library, Ithaca, U.S.A. 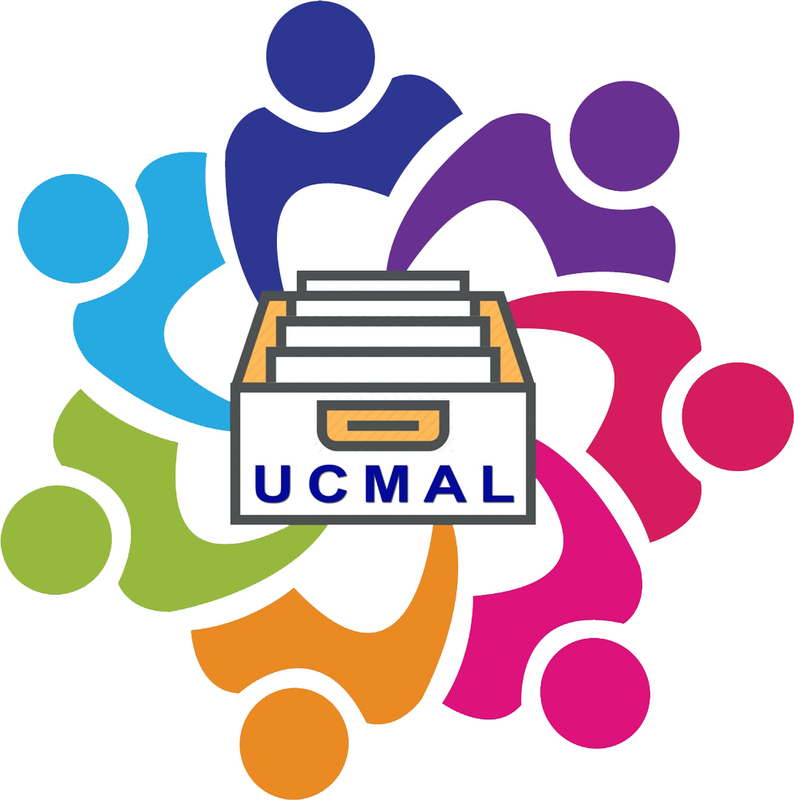 Under this project 2000 manuscripts on Myanmar customary law (dammathats), history, traditional medicine and literature (Pyo, Yadu, etc.) have been microfilmed. This section has also acquired 500 reels of 35mm microfilms and 5000 microjackets of rare and valuable Myanmar and English books. The Preservation and Conservation Section was set up in 1984. Fumigation of all stacks and manuscripts rooms arecarried out annually. 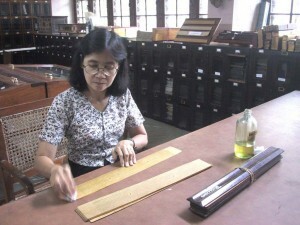 Palm-leaf manuscripts are repaired by replacing broken edges with blank palm-leaves. Parabikes manuscripts are repaired with local MaingKaing Shan hand-made paper. Rare and coloured parabikes with traditional paintings are kept in cardboard and wooden boxes wrapped in acid-free paper. There is also a binding section for books, periodicals and other documents. This section was set up in 1992. e-Catalogue can be accessed including English books, Myanmar books, Palm-leaf mss., Parabikes, periodicals, newspapers and Theses databases accessed with the ELIB Library Automation System. Some rare books, rare journals and rare palm-leaf mass.are digitized and available in e-book form. Invaluable paintings are collected and these are digitized and catalogued. Myanmar cartoon collection (1900-1948), rare photos, maps, rare palm-leaf mss. and colour also filmed parabikes are digitized. 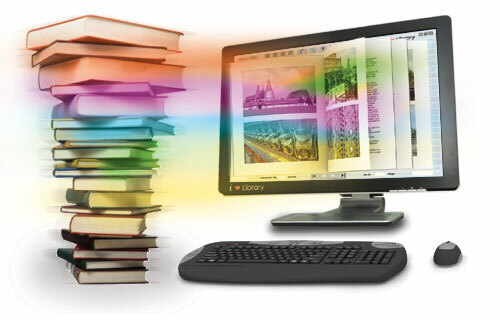 This section provides the electronic books and journals to scholars and researchers. 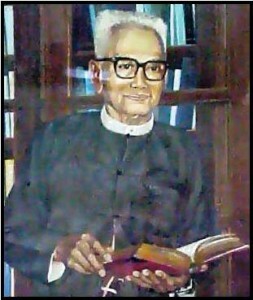 Complete set of Journal of Burma Research Society(59) also digitized in full text (1911-1977), CONSAL (Proceeding of First to Tenth Congress of Southeast Asian Librarians), Dissertations on ASEAN (abstracts) are searchable by key words. 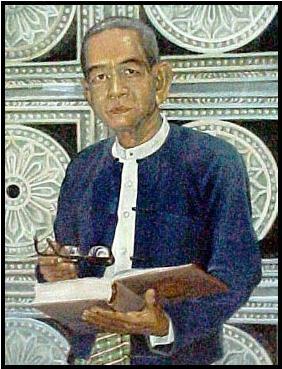 Over 15, 000 e-books on Myanmar (social science subjects) are collected in this section. Internet service is provided free of charge. Since 1971, U.C.L. has established a Gifts and Exchange Section under the programme of exchange of publications with Universities national and research libraries in several countries. 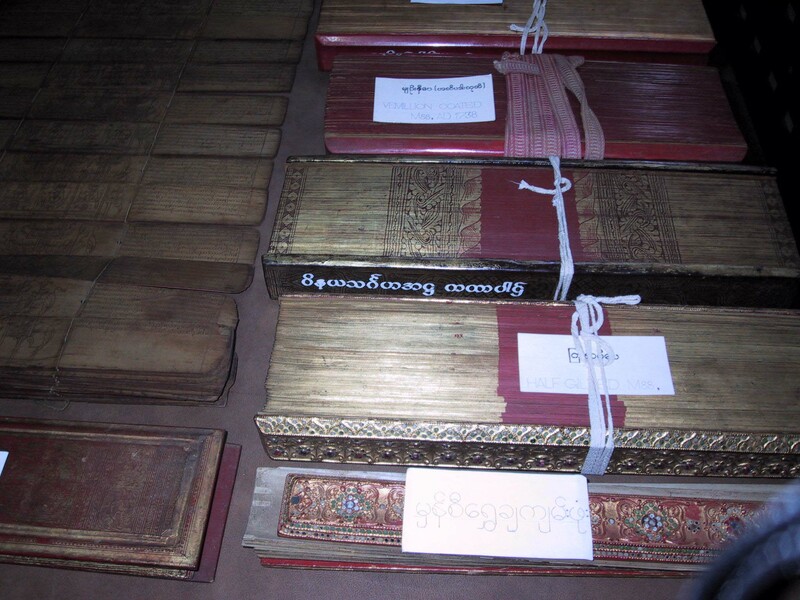 Myanmar Manuscripts Microfilming Project was started with this co-operation programme.This section is exchanging with 11 libraries abroad, including those from U.K., U.S.A., Germany, France, Japan, Thailand, Australia, China and Singapore. This section is responsible for financial and staff management and controlled by the Chief Librarian and Administrative Board.